Monday, April 30, 1888 Quite cool, with little rain, & few snowflakes in air. All our folks poorly from colds, but R- & Geo- extra busy, of course she was out awhile, & others in here besides the girls (few) to practice awhile P.M. & all of evening, with larger number older. I had good nights rest & quite as well except cold, but spending day much as usual, tho' guess "repairing" was greater part of work. Of course could enjoy greater variety of Boats seen (Thursday?). 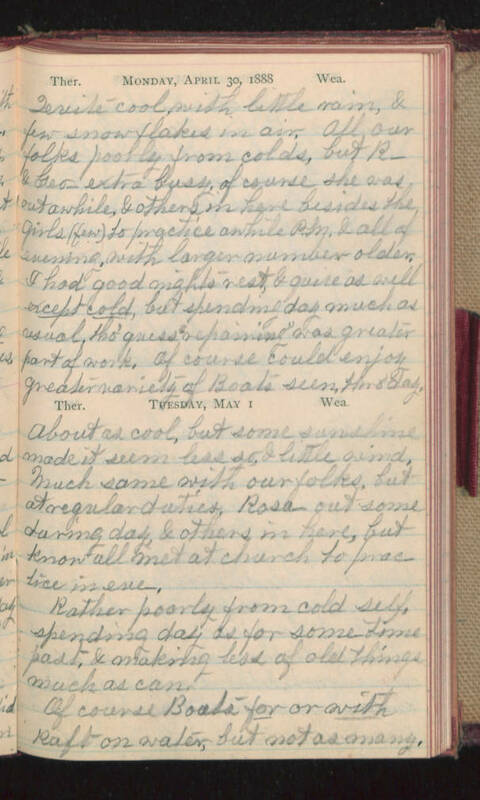 Tuesday, May 1 About as cool, but some sunshine made it seem less so, & little wind, Much same with our folks, but at regular duties, Rosa- out some during day, & others in here, but know all met at church to practice in eve. Rather poorly from cold self, spending day as for some time past, & making use of old things much as can. Of course Boats for or with Raft on water, but not as many.